Nasdaq reported fresh highs in its equity derivatives business during June, erasing a lackluster H1. Nasdaq (Nasdaq:NDAQ), the second-largest exchange in the world by market capitalization, has reported its latest tranche of trading volumes and metrics for the month ending June 2016, having rebounded strongly to notch fresh 2016 highs after months of diminishing figures, per a recent Nasdaq statement. 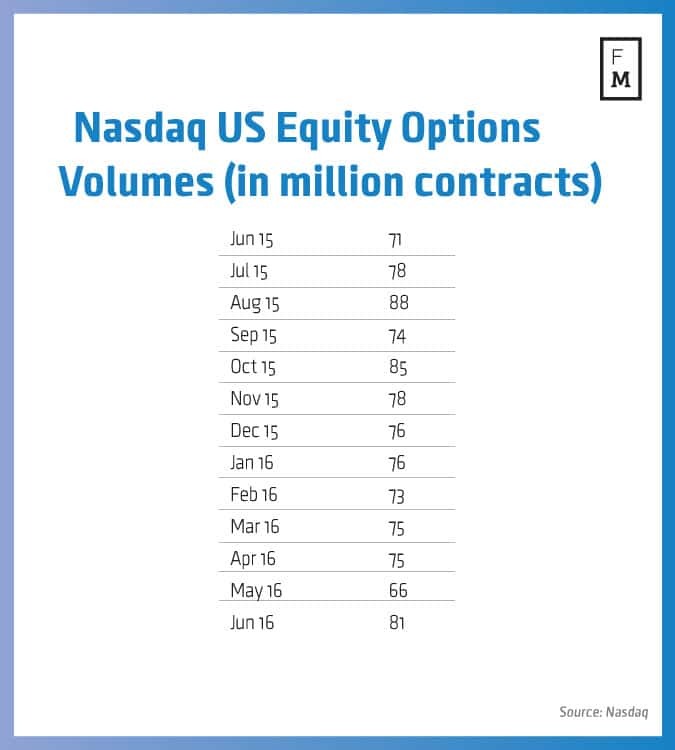 During June 2016, Nasdaq finally shook out of a narrow consolidation that had shackled its equity derivatives business – this was reflected in a figure of 81.0 million contracts, exploding by a factor of 22.7% MoM from 66.0 million contracts in May 2016, its highest performance thus far in 2016. This figure is also stronger when measured across a yearly timeframe, with the latest figures constituting a growth of 14.1% YoY from 71.0 million contracts in June 2015. In addition, Nasdaq’s European equity derivatives also posted strong results, surging to 12.8 million contracts in June 2016, up 100.0% MoM from 6.4 million contracts in May 2016. This ascension was also emblematic of a 70.7% surge YoY from 7.5 million contracts in June 2015. Nasdaq’s June 2016’s figures also were pointed higher across its Fixed Income, Currencies and Commodities business (FICC). In particular, US fixed income volume (in billion USD traded) yielded $1,969 for the month ending June 2016. This justified a climb of 21.0% MoM from $1,627 in May 2016 – the latest figures also illustrate a fall of -38.3 YoY from $3,184 in June 2015, one of the month’s lone blemishes. In terms of European fixed income, June 2016 was also largely optimistic, orchestrating a tepid increase in its volumes MoM. June 2016 saw 1.8 million contracts, up 5.9% MoM from 1.7 million contracts in May 2016 and down -30.8% YoY from 2.6 million contracts in June 2015. Last month, Nasdaq made headlines after Deutsche Börse AG completed the sale of International Securities Exchange Holdings Inc. (ISE) to the exchange, as it finished its divestiture of ISE for $1.1 billion. Nasdaq had also completed its acquisition of International Securities Exchange, after an earlier agreement with Deutsche Börse.